To see my portfolio click here or on any picture of any painting to access my flickr site. to my friends and neighbors for supporting my September 2008 election to the San Francisco Arts Commission's Artist Selection Panel. I am excited to participate in the decision-making process regarding the art to be displayed in and on the Ortega Branch Library after its upcoming renovation. My studio, JAG's Art Studio at the Beach, is a three-story waterfront home, studio and gallery, where I have lived since 1985; it has an unobstructed view of the Pacific and Ocean Beach, an area that draws to it surfers from around the world. On continuous display are over 100 pieces of art including my original paintings, giclee prints, drawings, 3-D pieces and mobiles. Paintings in the studio range in size from 7" x 10" to 4' x 8', and prices vary beginning at $100 for small prints. 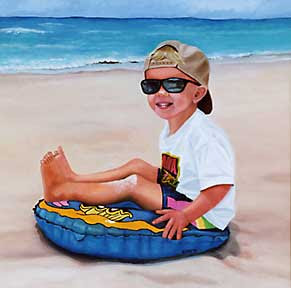 I am available for commissions, murals and children's portraits [see"Laura at the Beach" and "Joseph in his Shades." Please feel invited to come by, bring friends, enjoy the ocean view, and take home some art. My studio/gallery/home is OPEN DAILY, but giving me notice of your intended visit by phone or e-mail would be greatly appreciated. Giclee prints (French word, pronounced "jee-clay" meaning to spray in a jiggling manner) are such high quality reproductions of original paintings that it is often difficult to tell the print from the original. The process starts with a professionally taken photographic transparency that is used to make a high resolution scan. After adjustments are made for clarity and color accuracy, colored inks spray the image onto canvas or specially treated papers through the use of a high tech printer. Canvas prints are then manually covered with a clear topcoat to protect the print for many years from fading. I am so confident of this process that I will replace your print with a new one if it does not hold up as promised. Canvas prints are framed in black metal presentation frames, unless otherwise indicated or requested. Paper prints are custom matted to fit standard sized frames; the difficulty in shipping glass has precluded me from shipping framed paper prints under glass. However, any painting purchased in person at the studio is framed, matted and ready for immediate hanging. Also, any image can be made into a print that is sized to your specifications. If you have a space in your home or office that you would like to fill with a painting of mine, I can work with you on an idea and a final piece, unique to you and made to order. I can help with framing and installation. It takes me approximately one month to complete a painting of any size. You can bring me a photograph or just your idea. Ask me about it. We can work within your budget. Special rates on custom paintings related to surfing while I'm still working on the Surfers and Beach Life series. WISE SURFBOARDS, 800 Great Highway, San Francisco, CA 94121 has an ongoing exhibit (since January 2003) of my limited edition giclee prints on paper and canvas, approximately 24 pieces, all part of the Surfers & Beach Life series of paintings. All work for sale. New work replaces old and the exhibit changes periodically. Open 7 days a week from 9 am to 6 pm. 415-750-WISE www.wisesurfboards.com. This store is approximately 2 miles north of the art studio. JAG's ART STUDIO at the BEACH, 2366 48th Avenue, San Francisco, CA 94116 (between Taraval and Santiago Streets) has an ongoing daily exhibit of approximately 150 pieces of my handmade artwork, including original paintings, giclee prints, mixed-media pieces and mobiles. Please call ahead to Judi to make sure someone is there to let you in. 415-716-3004. Open 7 days a week. Born and educated in New York through high school, I grew up spending winters in Queens and summers on Long Island at the beaches near the Hamptons. I studied art at the University of Miami and the University of North Florida before hitchhiking from Florida to San Francisco in the early 1970’s, and making it my permanent home in 1978. While working full time in law offices, I continued to take classes at the San Francisco Art Institute, the San Francisco Academy of Art, and San Francisco State University, where in 1991 I graduated as a painting major with a B.A. in Art. Since then, I opened JAG’s Art Studio at the Beach where I create and sell my original fine art paintings, limited edition giclee prints and other hand-made items. People from all over the world come to San Francisco’s Ocean Beach to appreciate its beauty and add to it their own energy, colors and memories. I’m one of those people, making paintings from the heart about the place where I love to be living.